Saline agricultural drainage water within the Buena Vista Water Storage District is accumulating in shallow aquifers located below productive farmland. This saline water has risen to elevations where it increases the soil salinity in crop root zones resulting in reduced crop productivity and in some areas of the District, lands have been taken out of production because of the high saline groundwater table. 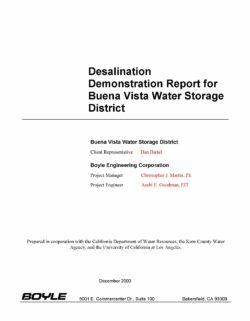 A reverse osmosis pilot plant was constructed to demonstrate the feasibility of desalting saline irrigation drainage water for use as a water supply for agricultural or municipal use. The demonstration plant was constructed in the Buena Vista Water Storage District northwest of Bakersfield, California. The plant operated during the irrigation seasons of 2000 and 2002. 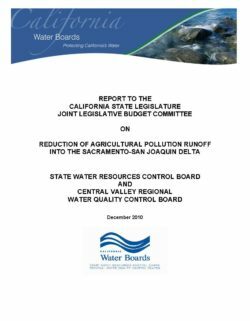 The Central Valley Regional Water Quality Control Board, (Central Valley Regional Water Board) staff has determined that replacing irrigation practices that produce return flow is the only method of ensuring a 30 percent reduction in agricultural pollution runoff to the Delta by 2012. The program would be focused within the Delta and San Joaquin River watershed and apply to surface return flow (tailwater). Tailwater can convey contaminants applied to or on the land surface, such as pesticides, sediment, fertilizer, and manure. Tile water (subsurface drainage pumped to surface waters) contains naturally occurring minerals found in ground water, and may contain contaminants leached into the ground water due to application on the land surface. However, tile water is not the focus of this control strategy, since it would take longer to implement the required control technologies. Irrigation return flow is the focus of this effort, since it is more amenable to control (versus storm water runoff) and over 60 percent of the exceedances of water quality objectives we have identified occur during the irrigation season.1 A target of converting 50 percent of the irrigated acres that produce runoff to more efficient irrigation practices that produce no runoff is recommended. A 50 percent conversion target is recommended, since there are other pathways for agricultural pollutants to reach the Delta through surface waters (e.g., pesticide drift, tile water drainage), so a larger percentage reduction in irrigation runoff would be needed to ensure that the overall 30 percent pollution reduction goal is achieved. 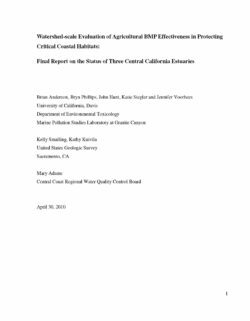 The estimated cost to the agricultural community to implement the required management practices is $250 million - $450 million in capital cost, assuming half of the one million acres of agricultural land requiring improved irrigation management systems would be targeted to meet the 2012 timeframe. 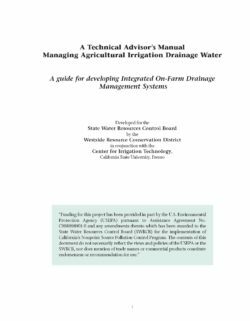 Additional Central Valley Regional Water Board staff resources of up to 10 PY would be required to ensure the required practices are implemented. •Retire poisoned lands from irrigation so that pollution from naturally high levels of contaminants such as salt, selenium, boron, mercury, arsenic and molybdenum is ended. •End wasteful and unreasonable uses of water as mandated under the California Constitution. •Slow or stop the spread of contamination to drinking water supplies, aquifers and aquatic food webs (including those with anadromous fish) where it now occurs, thereby protecting human and public health. •Redirect as much as 4 million acre-­feet of fresh water freed from retired lands to other beneficial uses within the Central Valley watershed, including fish and wildlife refuges, Delta ecosystem restoration and instream flows, and drought-­period municipal uses. •Require that solutions for retiring the poisoned lands from irrigation result in either no net change or an actual net decrease in energy consumption associated with use of those lands. 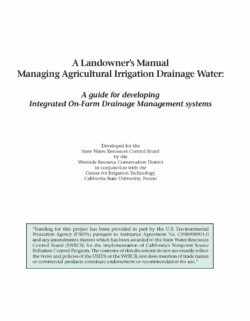 This report shares valuable information about agricultural drainage water in order to increase the understanding of its potential impacts and improve its management in the San Joaquin Valley. The Drainage Monitoring Program is a cooperative effort of State, federal, and local agencies. 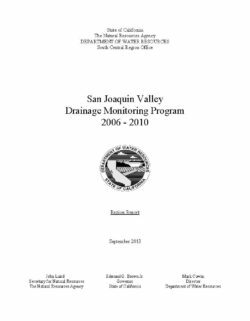 Program staff collect, assemble, review, evaluate, and disseminate data on both the quality of drainage water as well as the depth of shallow groundwater in the San Joaquin Valley. Fifty-two drainage sump systems are monitored for flow, sodium, sulfate, total dissolved solids, selenium, and other constituents. Staff also combine the Department of Water Resources' data with data from over 10 other agencies for this report. DWR used depth information, gathered from approximately 1200 shallow groundwater wells, to draw Present and Potential Drainage Problem Areas Maps for the period from 2006 through 2010. These maps show over one million acres of potentially impacted lands. Data provided by several agencies, including the Buena Vista Water Storage District, Central California Irrigation District, Firebaugh Canal Water District, Kern County Water Agency, Panoche Water and Drainage District, San Luis Canal Company, Westlands Water District, and DWR was combined to create the maps. DWR also drew electrical conductivity (EC) maps from ECs measured in about 690 of those wells for the years 2009 and 2010. All off the maps help inform managers of potential drainage problems in their areas due to encroachment of shallow groundwater. The number of agencies participating is a reflection of the significance of drainage problems in the San Joaquin Valley and the potential impacts. 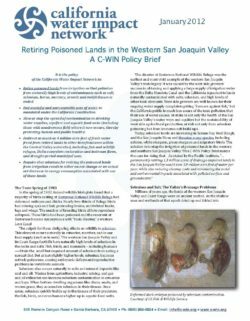 This report focuses on five years of data collection and compilation for the calendar years 2006 thought 2010, with a special focus on historical arsenic, boron, and selenium. In addition, pesticide and nutrient data have been added to this report for your use.. Along California's Central Coast, the Pajaro, Salinas, and Santa Maria Rivers drain to coastal estuaries that provide essential habitat for early life stages of commercially and recreationally important marine fish species, threatened anadromous fish species, migratory birds, and other wildlife. These are the largest watersheds on the central coast and each contains year-round, intensively cultivated agricultural land that supports a $3.5 billion/year industry producing most of the nation's lettuce, artichokes, and crucifer crops. Runoff from irrigated agriculture constitutes a significant portion of river flow during most of the year, and a number of studies have documented pesticide occurrence and biological impacts in these watersheds. Evidence of pesticide impacts has encouraged diverse stakeholders to begin implementing farm management practices (MPs) to reduce pesticide concentrations and toxicity in agricultural runoff. This project is designed to complement ongoing evaluations of individual MPs with measurements of pesticide concentrations throughout the estuarine environments, including the water column, sediments, and in resident biota. Biological effects were measured at the organism and community levels. Chemical analyses emphasized pesticide impacts because previous research in these watersheds has indicated these are the primary chemicals of concern impacting beneficial uses. A broad suite of pesticides were measured, including legacy organochlorines, widely-used organophosphates, increasingly-used pyrethroids, herbicides and fungicides. Sampling in the three estuaries was conducted from January 2008 until October 2009. A total of fifteen sampling events were conducted in each estuary, and these were divided between eleven irrigation season events and four storm events. Storm and irrigation monitoring included water toxicity and chemistry analyses for pesticides. Samples were collected at multiple stations in the estuaries and in key tributaries flowing to the estuaries. In addition, sediment toxicity was assessed at eight estuary stations and the tributary stations during three irrigation season sampling events. Benthic community characterizations were also conducted in May and October 2008. All sediment samples were analyzed for pesticides, as well as grain size and total organic carbon. Pesticide analyses in resident fish and sand crab tissues were conducted once in each estuary. The goal of this project was to establish a baseline of estuary conditions with respect to pesticide impacts as MPs are beginning to be implemented.